Jordan Zimmermann's stats this season look rather similar to his breakout 2014, except for his declining strikeout rate. This is probably not how Jordan Zimmermann planned to make his contract push. Zimmermann is a free agent after this season, and many expected him to stand out in a class that includes Johnny Cueto, Zack Greinke (opt-out clause) and David Price. Instead, he has a 3.74 ERA and 1.38 WHIP, both of which would be his worst for an entire season since he became a full-time member of the Washington rotation in 2011. After racking up a career-high 8.2 K/9 last year, his rate is back down in the low 6s this season. At this point, any team with deep pockets is going to have Cueto, Greinke and Price higher on its shopping list than Zimmermann. The funny thing about Zimmermann’s 2015 season is that a lot of the numbers, strikeouts and whiffs aside, look quite similar to his breakout 2014 campaign. Now, we can’t just dismiss the dramatic difference in his ability, or lack thereof, to miss bats this season. That’s the most important, pitcher-controlled outcome, and, at the risk of being obvious, a huge driver of success. Zimmermann isn’t inducing empty swings the way he did last year, and that’s primarily responsible for his downturn this season. We’ll get to that in a second, but it’s worth noting first that his other peripheral numbers are in line with last season. Zimmermann is walking more batters this season, but his 5.5% walk rate is still better than league average. There’s no significant statistical difference in his ground-ball rate, or his line-drive and hard-hit rate when you consider them as a pair. He was already elite at keeping the ball in the park but he has been even better this season, allowing just three homers in 77 innings. His FIP is 3.04, which would be the second-best mark of his career. His xFIP, which normalizes home-run rate based on fly balls allowed, is up at 4.14, a full run higher than it was last season. Still, there are encouraging signs in his numbers. Of course, none of that matters if Zimmermann’s strikeout rate remains at a Collmenter-esque 15.9%. Last year, Zimmermann set career highs in every meaningful strikeout stat. This year, in addition to all the ugly details we’ve already noted, his whiff rate is down to 7.5%. Zimmermann trails the likes of Aaron Harang, Jered Weaver and Tim Hudson in whiff rate, which wouldn’t be all that bad if it were 2007. I just checked the calendar, however, and it is not 2007. It’s 2015. This is a problem. Zimmermann has always been a fastball-slider-curveball pitcher. He has mixed in a changeup over the years, but he has never thrown it more than 5% of the time in any season. Last season, it was his slider that helped lead him to a career-best 22.8% K-rate and 182 strikeouts. Zimmermann threw his slider 18.3% of the time and got a whiff rate of exactly 20% with the pitch. It was the final strike for 54 of his 182 strikeouts, and hitters managed just a .209 batting average and .252 slugging percentage against the offering. This year, his whiff rate on the slider is down to 18.9%, and hitters have a .273 batting average and .318 slugging percentage against it. When Zimmermann got to two strikes last season, it was basically lights out for the hitter—especially with righties, since he could lean on the slider. He threw 199 two-strike sliders last season: 13 resulted in hits, 79 in outs and the remainder in a continuation of the at-bat, either via a ball or foul ball. This season, hitters have managed to hit .234 against his two-strike sliders. Let’s take a look at one example from Zimmermann’s most recent start. He struggled in his home state last week, allowing six runs on nine hits in 3 1/3 innings in a loss to the Brewers. The trouble started for him in the first inning in a situation he typically extricated himself from last year. With two outs and runners on the corners, he was facing the right-handed hitting Aramis Ramirez. In a 2-2 count he went to—what else?—the slider. With all due respect, that’s a terrible pitch. It starts low and away, and goes even farther out of the strike zone by time it gets to the catcher. Ramirez diagnoses it as a slider immediately, and doesn’t even think about swinging at it, letting it pass harmlessly for ball three. Zimmermann doubles up on the slider. This one, too, is bad, albeit for a different reason. Zimmermann gets under this slider, leaving it up in the zone in a very hittable spot. He’s lucky that Ramirez just fouled it off. He would, however, drive the next pitch, a fastball, for a two-run, two-out double. In the same spot last season, Zimmermann was more often than not able to get strike three and move on to the next inning with no harm done. This season, hitters, like Ramirez did here, have been able to stay alive more often, and that has resulted in more balls in play. That has really been Zimmermann’s issue this year. It’s not that he’s surrendering harder contact this year. It’s just that he’s allowing more contact, and that naturally leads to more balls finding some grass in the outfield. His strand rate last season, thanks to all his strikeouts, was 75.8%. This year, it’s 68.4%. There’s no great explanation for the lack of whiffs on the slider this season. The velocity and movement are nearly identical to last year. Zimmermann is generally spotting it well, hitting the outside corner, or just beyond it, against righties. The problem may be its predictability. Last season, Zimmermann got hitters to swing at 36.9% of his pitches that missed the zone, with the slider doing the heavy lifting in that category. This season, they’re offering at just 31.8% of pitches that miss the zone. When movement, velocity and location are all the same, it’s most likely that hitters have made the necessary adjustments. It may be just one at-bat, but look again at that first Ramirez GIF. He gave up on the pitch immediately. He’s in a 2-2 count against a good pitcher, and he’s comfortable enough to guess slider. 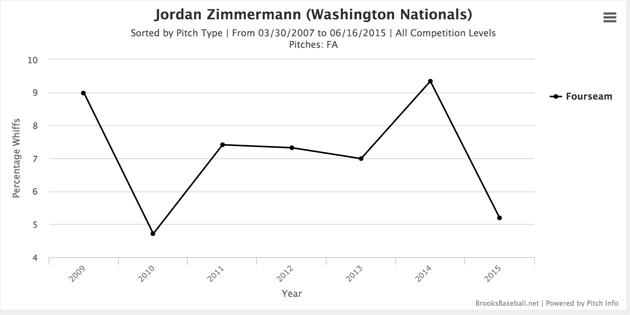 There’s also evidence that Zimmermann’s whiff rate was artificially inflated last year. He got empty swings on 9.3% of his fastballs. That’s simply unheard of for any fastball, let alone a straight four-seamer. Clayton Kershaw and Felix Hernandez have reached that level once in their respective careers. Scott Kazmir, who, according to Pitch F/X data, had the most valuable four-seam fastball in the majors last year, had a whiff rate of 8.1% with the pitch. Zimmermann’s four-seam whiff rate had never been better than 7.4% for a full season in the majors. Take a look at where it is this year. Thanks to Brooks Baseball, we see that Zimmermann’s fastball whiff rate has taken a nosedive to 5.2%. He’s actually getting more horizontal movement on it this season, running it farther in on the hands of righties. It’s not that the pitch is any worse this year. It’s more that the 9.3% whiff rate from 2014 was unsustainable. Where does all this leave the fantasy community in regards to Zimmermann? Without the strikeouts, he’s really no more than a top-25 starter, and that assumes the best-case scenario for the rest of the season. If you can still get someone to come close to matching his preseason value in a trade, that’s a deal you should take.